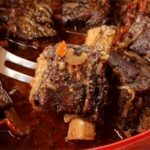 Mmmmmm….Braised Beef Short Ribs…one of our faves! 1 Preheat oven to 350°F. Season ribs generously with salt and pepper. Heat oil in a large, heavy bottomed ovenproof dish over high heat. Add ribs and brown on all sides. Brown in batches if you need to so that the ribs don’t get crowded (this will help with browning, rather than steaming). 2 Transfer ribs to a plate. Pour off excess fat. Add the onions, celery, and carrots to the pan and sauté, stirring often, until lightly browned, about 5 minutes. Remove the vegetables from the pan, set aside. Add the wine to the dish, deglazing it, scraping off any browned bits from the bottom. Reduce the wine by three-quarters until thick and slightly syrupy, about 15 minutes. 3 Return the ribs to the dish, add the beef stock and enough water to cover the ribs. Bring to a boil, cover with lid (or foil), and place in the oven. Braise, cooking in the oven, until the meat is fork-tender, 2 to 2 1/2 hours. During the last 1/2 hour of cooking, add back in the vegetables. Allow the ribs to cool in the liquid, then cover and refrigerate overnight. 4 The next day, remove the excess fat that has solidified on the top. Preheat oven to 350°F. Cook uncovered until the liquid has reduced by about three-quarters (approx. 1 hour). Occasionally spoon the sauce over the ribs, until the sauce is thick and ribs are glazed. Take care not to burn the glaze; move the ribs around in the pan to keep them from burning or sticking. Serve over mashed potatoes, pasta, or rice. Our fave is mashed!